Villa DOL Rental St. Barts F.W.I. A distinct European feel laces the island’s personality and atmosphere. It is most obvious in Gustavia as it is considered by many to be the fashion headquarters of the Caribbean. Many of the top European designers are well represented. There are a number of delightful places to eat at one of the many waterfront restaurants and they have many superb bottles of wine. Jesse Tyler Ferguson & Justin Mikita Celebrate New Year in St. Barts! Shell Beach is the closest to the town of Gustavia and is only a ten-minute walk from the capital. The name comes from the tiny shells that make up the sand. There is lunch or dinner available almost at the water’s edge. Saline Beach is a local favorite. It is a long, pristine, and is just a short drive over the mountain from St. Jean. It is popular for body surfing and naturalists. St. Jean Beach is decorated by gourmet restaurants and hotels. This beach is divided in two by the Eden Rock Hotel. One half of the beach is located at the foot of the airport runway where you will find La Plage Restaurant. There is a protective reef that helps prevent any high surf. Wind surfers flock here. Gouvereneur Beach is at the bottom of some winding roads, however, well worth the trip. There are no restaurants on this peaceful beach, so you may want to bring a picnic. 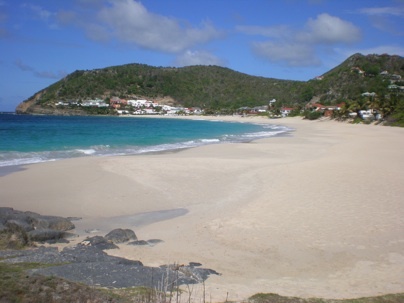 Flamands Beach has a local name of Anse de Flamands. One of the widest and prettiest beaches with white sand and rolling waves. ASB Grocers - With an experience and a knowledge handed down from 5 generations of grocers in St Barths for over a century, ASB is driven in its search for Progress and Innovation in the field of food. La Cave du Port Francclose to Gustavia harbor, one of the best wine cellars in the world. Primantilles Specializes in importing and distribution of fresh, “super-fresh,” and frozen foods.